Unknown | Thursday, September 20, 2018 | Hacking Safety | Tips n Tricks Be the first to comment! Giga Trickx | Wednesday, November 01, 2017 | Tips n Tricks Be the first to comment! After Facebook invest $1billion to be the owner of Instagram, then online media went nuts. But this is nothing when the wave hits media with news that Facebook has next targeted WhatsApp to bring marvelous changes. It is incomparable to what WhatsApp receives from Facebook with a whopping amount of $19billion. This has been the breaking news for several days. One of the most popular and amazing apps, WhatsApp, has faced a fierce competition in the market with rivals like WeChat- the most popular app in Asia Pacific and China region. The line is another tough rival to WhatsApp those days which has its own theme park. Are you always using WhatsApp to be in touch with your important peoples/ parents/wife/boyfriend or girlfriend? If so, you will be amazed to know that you can create shortcuts of your conversations and they will appear on your device’s home screen. Isn’t it a streamlined experience to enjoy? For this, you have to open your WhatsApp; then tap on the chats tab. After this long press the required person’s conversation that you want to create a shortcut for. Click on the added chart shortcut button popping up from the menu. Your shortcuts will be created. If you are enthusiasts of photography, then you might get annoyed of the message repeatedly showing “your memory is full; delete some items from library images”. As WhatsApp’s sharing feature is a remarkable tool to enjoy; friends keep on sending hundreds of images and jokes every day. Those images are stored in our device’s library and with changing the time they clog up your library. This takes a lot of your valuable memory space and can make you embarrassed if caught up with the wrong pair of eyes. You can stop this to happen by simply tapping on the options showing in the manner of three vertical dots at the top-right corner. From there you can go to settings and then click on the data usage. Under this section, you will find the tab written media auto-download. Tap it to uncheck all the boxes and now you can only save the required images/files that your friends shared. If you forget things every now and then, then definitely this trick is worth to use. WhatsApp’s schedule messages trick can help you out in remembering your important meetings and parties to attain. If your phone is used by multiple people, then you should know how to lock your WhatsApp profile and keep its contents away from your loved ones. You have to seek the help of a third-party app for this. Android users can go with the AppLock whereas iOS users can depend on iAppLock. They are trusted and reliable source to keep your data safe. 5. Want to recover deleted or lost messages? Then this trick is for you! Whether you lost the data from your WhatsApp due to malfunction of some other reasons; nothing to worry about as WhatsApp saves all your conversations on the SD-card of your handset. You just need to go to the SD card of your mobile via accessing the file explorer. Then move to the WhatsApp folder and enter into the database folder. Inside it, you will find a file named as ‘msgstore.db.crypt’. This is the file containing all your conversations which you have sent or received in the same day. You will also see another file named ‘msgstore-yyyy..dd..db.crypt’ in the same folder. This file is containing all your messages received or sends in the last seven days. Simply access them with any text editors and you can now able to read your entire WhatsApp messages those were lost or deleted. Sometimes we change our mobile number which demands to change our WhatsApp number simultaneously. In that case, we need to contact our near and dear ones about the change. To change WhatsApp number, you need to click on the settings; then go to account; then tap on the change number option.It will ask you to enter your old WhatsApp number and then to enter your new number. After entering your new number and hit the ok button, it will send a verification code to the same number that you have updated from old to new. After verifying the number, it will show that your number has been changed successfully. Yes, it is possible to create fake WhatsApp conversations with anyone even with celebrities. You can do this and keep on astonishing your friends. Trust me they will never know that you have made them fool via creating fake WhatsApp chats with notable persons. All you need to do is to install a third-party app called WhatSaid and you will be able to create fake conversations with any big star by simply using their pictures and name. Create your own fake messages and prank with your buddies. 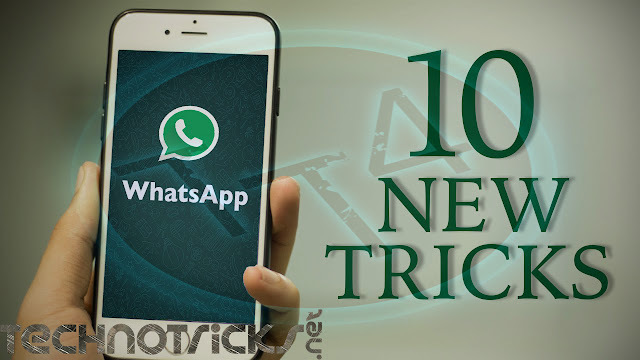 Transferring files from Phone to PC or PC to Phone is easy with this WhatsApp’s amazing trick. You can also compress the file without any software. Follow the guide to make it happen! At first, save your number with your name on your device. After which your WhatsApp icon will see an option message like +91******. Click on it to chat with yourself. This trick will allow you to send any file to yourself. Now is the time to know how you can share the files from Mobile to PC and PC to mobile. Once you access the web application of your WhatsApp via scanning the code on your computer, you can select the files and upload it to the message box and send it to yourself. After hitting the enter button, you can see the same file sent to your PC. Click to download them on your PC or do the same with your device. This is the trendiest trick of WhatsApp these days on the internet. Here I am sharing it with you all folks so that you can be another in the list to use multiple WhatsApp account in a single device. There is an Android application called Ogwhatsapp with which you a use multiple accounts. Download and install it on your android device and fulfil your wish to handle dual accounts in a single device. Since 2010, WhatsApp has taken the market, but still, people are unaware of the background change. Change the weird background image of your WhatsApp and filled it with anything you like the most. Go to the options> then to settings> then to chats and then select the wallpaper of your choice. You can also select and make any picture your WhatsApp background from your phone’s storage. Unknown | Wednesday, November 01, 2017 | Tips n Tricks Be the first to comment! Today we will clarify you the most ideal approach to welcome all companions to like page on Facebook. This will enable you to give colossal development to Facebook to page likes and spare time. We simply need to introduce expansion or even run a little content to welcome all companions to like Facebook page. Which you can likewise use to welcome all companions to Facebook occasion. Be that as it may, this strategy is just attempting to welcome all companions to pages and occasions. So here is the most ideal approach to welcome all Facebook companions to like page. Invite All Friends On Facebook Page (Chrome Extension). Click on the link below to Add the extension. 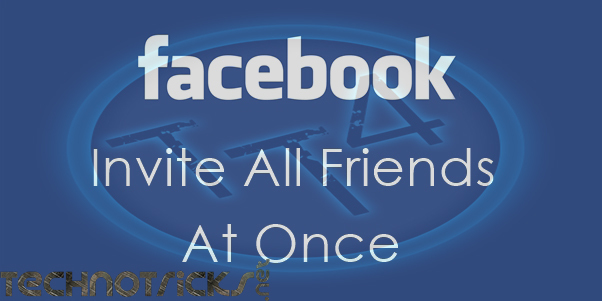 This extension will provide the feature to invite all Facebook friends by one click. After the installation of this chrome extension small icon will start appearing on the top right side of the browser. A button will only appear when you open Facebook website otherwise it will disappear. Now login into account whose friends you want to invite to like facebook page. After that open Facebook page and then click on the Invite all friend button. New pop up window will appear with name of all friends.